Over the past few weeks, our house has been suffering from a cold that just seems to be bouncing back and forth between the members of our household. This week, our 22-month old son was the main victim. The result was an increase in toddler meltdowns and a pronounced decrease in the quality and quantity of sleep for all of us. Needless to say, this has not been an easy time. But somehow – just at the very moments when things get tough – I’ve found reminders of all of the love and support in my life. In all of these moments, I’ve felt my heart bubbling with love and gratitude. Sometimes, it’s hard to see the forest through the trees. This week, I’ve been fortunate to be able to peek through the challenges of this time, and glimpse the loveliness of my life. This past week, I was listening to a recent episode of One Bad Mother. The conversation was about struggling with reflexively saying ‘no’ to your kids – even when you don’t really have a problem with what they want to do. My son is young enough that I’m not yet struggling with being a ‘no’ machine, but I do find myself reflexively saying something else. My personal catch phrase? “Be careful”. I cannot seem to stop myself from saying “be careful”. “Be careful with the cat”. “Be careful climbing on the couch”. “Be careful on the stairs”. “Be careful”. “Be careful”. “Be careful”. All. Day. Long. Obviously, some of this is justified. My son is not yet two. We still have a baby gate for our larger staircase. He starts to lose his balance and run into things when he’s tired. He is definitely not at stage where he doesn’t need any reminders to be careful. At the same time, my son is already a fairly cautious child, as toddlers go. He is not particularly anxious. He gets a kick out of being a little bit scared, like when his dad jumps out at him from behind a corner. But he is thoughtful and deliberate, and you can see him thinking through how to tackle a new feat before he actually tries to tackle it. When he was a baby, he routinely practiced new motor skills in the safety of his crib before he would dare to try them anywhere else. I, on the other hand, was an overly cautious child. My mom had to convince me to let go of her hand in the grocery store when she needed both of her hands to lift something (or to stop my sister from running off). I was scared of climbing and hated hanging upside down. And while I would not consider myself an anxious adult, I do still fall into the camp of: “I’m cold, so you need to put on a sweater”. It’s definitely not my favourite part of myself. Even as a kid, I wished that I could find a way to just let go a bit. Now as a parent, when I hear myself say “be careful” for the seven-hundredth time that day, I can’t help but wonder if my worrying tendencies are at risk of stifling my son’s independence. Not much fun, and not a great way to learn, either. 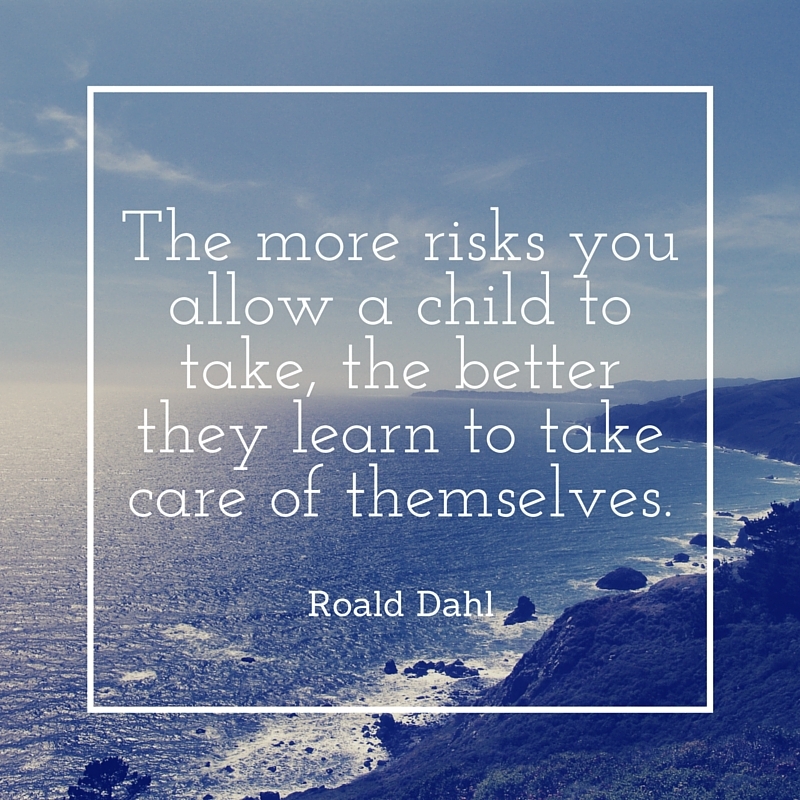 Roald Dahl once said “The more risks you allow a child to take, the better they learn to take care of themselves”. This makes a lot of sense to me. After all, who among us doesn’t credit our biggest risks and/or failures with our best learning experiences? Either we rise to the challenge and boost our self-esteem in the process, or we find out what doesn’t work and try to do better next time. And this is really what I’m talking about when I’m thinking about ways to get over my “be careful”-itis. I’m not going to avoid saying “be careful” when my son could really hurt himself or when he can’t reasonably be expected to understand the potential consequences of his actions. But I do want to try to avoid reflexively saying “be careful” in circumstances that he can navigate on his own. Maybe it’s ok for him to learn that if he’s not paying attention to what he’s doing, and a board book lands on his foot, he probably won’t like it. And he’ll learn to take better care of himself the next time he’s at his bookshelf. 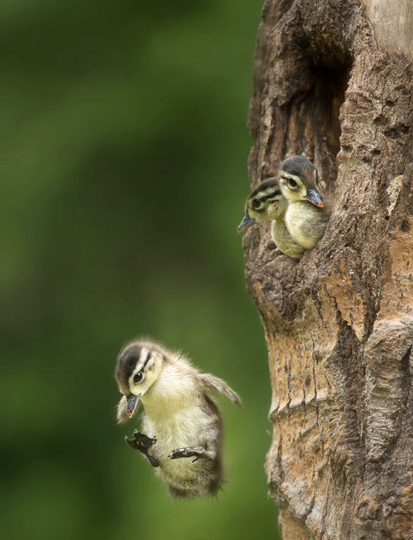 I mean, how else does a little bird learn to fly than to start by falling? It’s not like mama bird kicks them out of the nest right from day one. She watches and waits until they’re ready. After that, there’s really no other way to do it. Even typing this makes me feel a bit guilty and gets the worry machine going in my head, so I know it’s probably something I need to work on. In the meantime, I’m just going to try to channel my inner Dory and just keep swimming.